Tunnel made of colored panels in arc shape. Among the most sought-after venues of New Delhi, it is blessed with meticulously designed settings. Dimensions : Total Area : 2200 Sq.ft. Width of span: 6 meters. Capable of withstanding wind gusts of: 90 km/h. The Tunnel has been especially designed to withstand high temperatures and increased humidity levels. A single gable, suitable for all types of grounds. The Tunnel is suitable for growing all kinds of non-trellised crops. 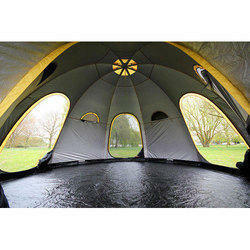 The same principle as a dome tent but in the shape of a tunnel. 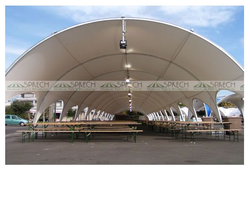 We are involved in offering to our esteemed clients an extensive range of Tunnel Tent. Tunnel Tent come with supporting metal frames and can be custom developed as per the specific requirements of our clients. We also have the competence to meet the bulk requirements of our clients.